Qnap delivers a streaming box on steroids. But it's not the easiest device to set up, and it's light on apps for tasks other than media streaming. 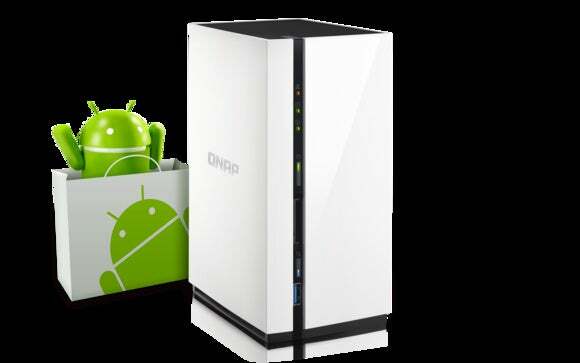 What happens when you take a network-attached storage (NAS) box and marry it to the Android OS? You get a device that’s capable of holding up to 20TB of data—inlcuding audio and video files—that can also tap into a wide range of online music- and video-streaming services. Add an HDMI output, as QNAP has with their new TAS-168 and TAS-268 (one- and two-drive bay NAS boxes respectively) and you have a device that can play all of it on your TV, as well as stream it across your network. That’s no mean feat. It’s even affordable. Well, affordable for a QNAP product anyway: $199 for the single-bay TAS-158, and $249 for the two-bay TAS-268 that I tested. Those prices don’t include the drives to put in those bays. As for the 20TB number: That’s if you can find WD’s new 10TB hard drives. For the time being, you’ll more likely max out with a pair of Seagate’s 8TB drives, which will add about $500 to the cost of the box. If you’re not extremely comfortable with the concept of installing your own storage, there’s other stuff you should know. For the techier among us, the TAS-x68 is a compelling home multimedia playback solution. But I’m guessing most consumers won’t want to wade through the installation of hard drives.The task isn’t significantly harder than installing a battery in a remote, but the concept might be bit foreign. And whether you're installing software or just using the TAS-x68, you're unlikely to ever forget that this is a NAS box. Actually, the Android home screen on the TAS-268 looks better than this, but this app page shows you that it is indeed Android. To my mind, what QNAP should have done was simply have Android pop up when you attach a display, and have you log on the first time. Sounds like a no-brainer, right? But there’s also a way to administer the NAS portion of the box using the direct-attached display. You can bypass this after setup, but you’re hit with a foreign concept right off the bat. I say just provide a way back from Android, which would be easier than pie for users who know NAS. Also, instead of providing media players that immediately recognize they’re on the NAS box and pull up content automatically, QNAP uses its regular mobile apps, which are designed for remote access. So every time you run one of these, you must select the TAS-x68 replete with its IP address (e.g. 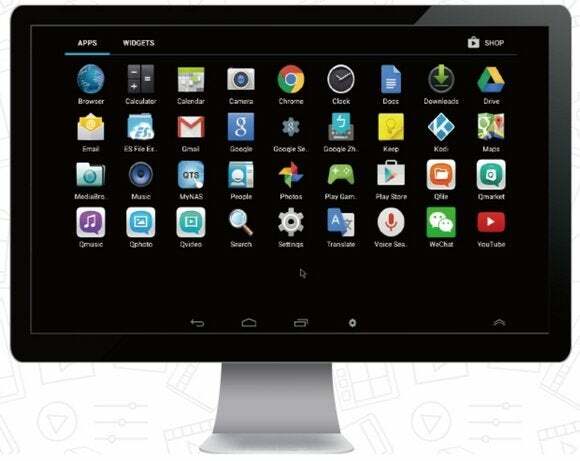 192.168.1.105) before you can play your music, videos, and other files. That’s easy if you understand networking, but unintuitive and confusing for the average consumer. I also encountered a number of minor glitches, such as the display not going to sleep, poorly rendered fonts, and missing scroll bars. But its failure to hide the NAS complexity that’s the main issue here. If you’re still with me, and haven’t moved on to TechHive’s reviews of the TiVo, Roku, Fire TV, or Apple TV platforms, there’s a lot of good stuff discussed below. The TAS-268 is a clean-lined, shiny white box with black highlighting. It measures about 7.0 inches high, 5.0 inches deep, and 3.5-inches wide (the TAS-168 is thinner because it holds only a single drive). Either one will look right at home amongst your other entertainment equipment. Perhaps not quite as at home as QNAP’s more -expensive HS-251, but comfortable still. It has a front USB 3.0 port with a copy-the-contents button for easy transfer of files onto the box. There are an additional four USB ports, an ethernet jack on the back, as well as the aforementioned HDMI 1.4b port (supporting maximum resolution of 4096 or 3840 x 2160 at 30Hz). The TAS-268 with its unique keyboard/touchpad remote by its side. 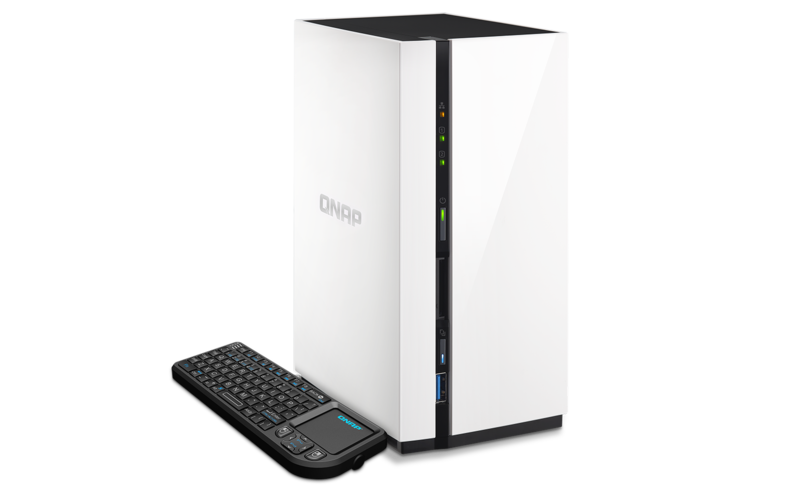 QNAP includes a clever little half-keyboard, half-trackpad remote that makes it easy to enter text and fairly easy to browse the interface. It’s rechargeable, but for some reason uses a mini-USB cable rather than the more commonplace micro-USB. Cleverer still would be if it functioned like LG’s Magic remote to move the cursor about by waving. Because of the USB ports, you may also attach a real mouse and keyboard, or any other type of control that the TAS-x68s understand. The company sells a normal remote, but it was back-ordered when I checked online. Once you’ve booted to Android, you can use any of the myriad of apps and services available available on that OS, including games, browsers, Hulu, Netflix, Amazon, and so on. 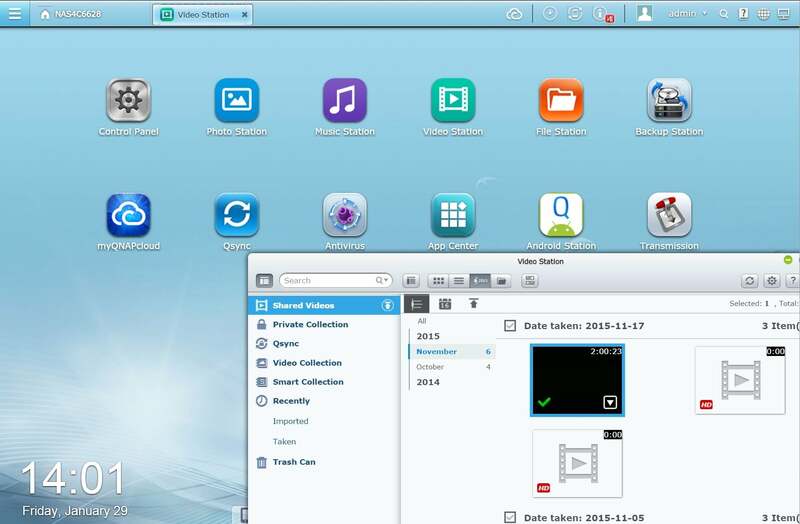 You can also play any of the multimedia files stored on the NAS box, albeit not as easily as you should be able to. Multimedia performance is quite good, if not perfect. The DLNA server flawlessly delivered TIFF, GIF, JPEG, PNG, and BMP images; and it streamed M4A, MP3, WMA, OGG, APE, FLAC, and WAV files as well as both Apple and Windows lossless files with up to 32-bit resolution and 96kHz sampling rates without a hitch. It also easily handled most types of video, though 3840 x 2160 video was downscaled to 1920 by 1080, and videos with frame rates higher than 30 frames per second would not play. . When output to an attached 3840 x 2160 display, few of my 2160p videos would play satisfactorily. I don’t know if the CPU doesn’t have the juice, or if the codecs are not fully optimized for it yet, but 1080p was the practical limit. Within that limit, the box understood every popular file type I threw at it and some—like OGG Theora—that aren’t. Note that when using streaming services such as Hulu, Netflix, and other on the TAS-268, video is output to the local display only; as with most other streaming boxes, there’s no mechanism for streaming them across your home network. The TAS-268 uses a Realtek RTD1195, dual-core 1.1GHz ARM Cortex-A7 CPU with an integrated Mali-400MP2 GPU and has 2GB of DDR3 system memory. But this box also has a trick up its sleeve: Its OS runs on a 4GB SSD. As QTS is a rather compact variation of Linux, that’s possible with room to spare. I was more than pleased with the apparent speed of the TAS-268. I’ve never really known the QTS operating system/Web interface to feel quick before. On the TAS-268, it does. If you haven’t seen QTS—a full-on, windowed operating system in your browser—look below. It’s impressive. What you’re looking at here is not a full screen capture, it’s QNAP’s QTS 4.2 operating system inside a browser window. All that said, CrystalDiskMark and my copy tests rated the TAS-268 at around 50MBps both reading and writing—with an SSD installed. By comparison, a Synology DS414 Slim that I frequently use reads at 110MBps and writes at 80MBps—about average for a higher quality, NAS box. Put another way: for straight file operations, the TAS-268 is slow. 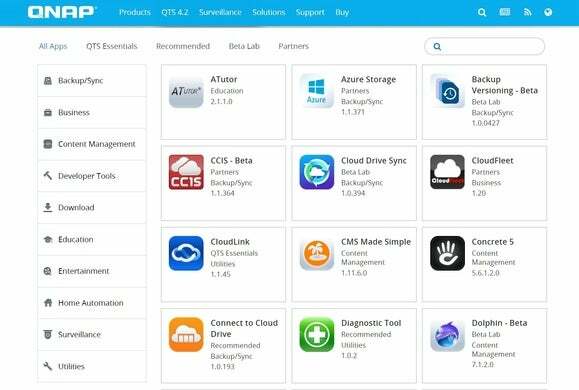 Normally, there are a host of QTS apps that cover everything from displaying images to video surveillance, along with a host of more traditional NAS/server functions. But some of the QNAP apps I’m used to, in particular an email server, aren’t available with the TAS-x68. Many of the apps available for other QNAP NAS boxes are missing from the TAS-x68’s app store. When you access the QNAP app store from the TAS-x68, the selection is particularly miserly. However, I found many of the missing apps at the QNAP Web site’s app store (seen above) where they may be downloaded and installed manually. I was told the lack of selection is because QNAP hasn’t re-compiled everything yet for the ARM CPU, not because these boxes are a bit cheaper than other QNAP products. 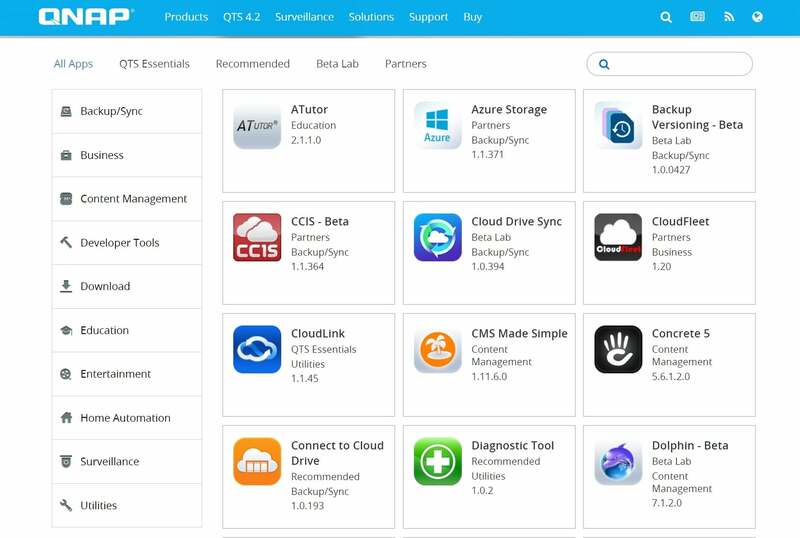 if you’re a techie seeking the full-on QNAP experience for less cash, take a close look at the app selection before you buy. The TAS-268 and its TAS-168 cousin are a tough call for me. While they actually outshine the consumer media streamers in capabilities, they’re nowhere near as elegant or easy to set up and use. That makes them largely a no-go for the average consumer. But if you have the tech chops or are the adventurous type, the TAS-x68s are a very capable. I only wish they were better with 2160p content. While you get many of the capabilities of a Roku, Apple TV, or Fire TV with this NAS box, it's not as easy to use as those devices. It's also currently missing some of QNAP's techier apps, including an email server. But if you have the tech chops, the TAS-268 is multimedia playback option worth exploring.